Ezviz has produced some terrific, inexpensive DIY home security cameras: the Ezviz Mini Plus, a full-featured indoor camera small in both size and price, and the Ezviz Husky, a weatherproof outdoor camera. Now, the company has released the Ezviz Mini 360 Plus ($80), a pan-and-tilt camera for rooms so large that a fixed-angle camera won’t do no matter how wide its field of view. The 360 Plus is an orb slightly bigger than a baseball. The top half houses the camera lens, which tilts a total of 90 degrees. The entire upper body can pan 340 degrees. The bottom of the 360 Plus is flat, so it can be set on any tabletop surface. Alternatively you can mount it to the ceiling upside-down with the supplied screws. The 360 Plus covers a lot of ground with its pan-and-tilt features. The 360 Plus also features night vision up to 33 feet, and two-way audio for communicating remotely with kids or pets at home or warding off any intruder you catch in the act. You also get IFTTT integration via the Ezviz app, which allows you to connect the camera with other smart home products such as Amazon's Alexa, a Nest thermostat, and Wemo switches. You can store video locally to on up to a 128GB microSD card. Seven- or 30-day event-based CloudPlay storage subscriptions are also available for $6 per month/$60 per year or $11 per month/$110 per year, respectively. A 30-day free trial comes with either subscription. The 360 Plus can be connected to your Wi-Fi network—the best option for freedom of placement—or tethered to your router with an ethernet cable. I opted for the first method. Once you download the Ezviz app, you just add the camera by scanning its QR code and follow the app’s prompts for connecting it to your wireless network. 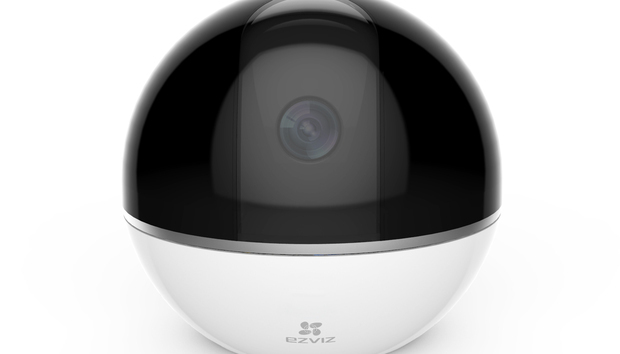 The EZVIZ Mini 360 Plus' motion detection tracking follows a person as they move through the room. You control the 360 Plus with the same recently redesigned app used with the Ezviz Mini Plus and Ezviz Husky. Basic functions including an on/off switch, mute button, and multi-camera view are directly below the live feed window. Under these is another toolbar with pan-and-tilt controls, a mic trigger, and digital zoom. At the very bottom of the home screen is a timeline that lets you scroll through the day’s video feed. There are three ways to use the pan-and-tilt feature. The easiest is to do it manually. This mode presents you with a blank area beneath the live feed window on which you swipe your finger. Quick swipes up, down, or to either side rotate the camera incrementally in that direction to set end points. Dragging and holding in any direction makes the camera pan or tilt continuously until you either remove your finger or it reaches the end of its axis. Several pan-and-tilt cameras use gesture control— as opposed to directional arrows, for example—and it can be remarkably imprecise, with the camera spinning to the end of its travel with the slightest swipe or barely moving an inch no matter how long you drag a finger on the screen. The 360 Plus, however, was very responsive and accurate, with barely a second delay starting or stopping its motion. An alternative to manual pan-and-tilt is to use Panoramic 360-degree Touch Navigation. The first time you enable this mode, the camera takes a panoramic photo of the room and saves it. After that, you merely tap a spot on the photo and the camera will pan or tilt to that point. This was also impressively accurate and became my go-to method of monitoring my living room. Lastly, there is Auto Tracking. When the camera detects motion, it will follow the moving body through the room. As a test, I walked from my living room to the kitchen and back; the 360 Plus shadowed me every step of the way. It worked dependably in daily as well, faithfully tracking other family members and pets as they moved about the room. The only pitfall I see with this feature is that someone must pass in front of the lens for it to activate. With just a 92-degree viewing angle, the lens leaves a lot of ground uncovered, so an intruder could conceivably enter the room being monitored and go undetected if they're in a blind spot. This is where audio detection would come in handy, as it could pick up noise to alert you to off-camera activity. Perhaps it will be included in the next version. The camera’s 1080p resolution is delivers crisp video with rich colors. There is a small amount of the image bending that’s common with wide-angle lenses but not enough to distort the image. Night vision mode also offers sharp detail and good contrast. The Ezviz app’s video history timeline makes reviewing the day’s footage a breeze. Motion-detected events are highlighted in orange so you don’t have to scrub through hours of video to find possible evidence of a break in. The daily recap feature, which condenses every motion event into a video digest, is great for quickly reviewing the days’ events when you get home from work. The Mini 360 Plus is a solid addition to Ezviz’s security camera lineup. The lack of audio detection is not inconsequential; it would greatly enhance the effectiveness of the motion detection tracking. But for $80, I’m not going to complain too much. For most scenarios, a fixed-angle camera like the Ezviz Mini Plus is all you need. But if you need to monitor a particularly big room or office space, the Ezviz Mini 360 Plus will cover much more ground.